Italian Troops Travel to Farah. About 50 Italian military personnel are now in western Farah province to support Afghan forces during operations against militants. (MENAF.com, Feb 7, 2018). TFSW Marine Advisors Worked at Kandak Level. The Marines from Task Force Southwest are working with the Afghans in Helmand province at corps, brigade, and even (at times) down to battalion level. The past rotation of Marines did this without suffering casualties - the current rotation of Marine advisors may get even closer to the front lines. Read "For U.S. troops in Afghanistan, new questions about where to be in combat", The Washington Post, February 8, 2018. SOD-O TAA's ANASOC and More. The Special Operations Detachment-O of the Maryland Army National Guard has been working at Camp Morehead (Camp Commando) for the past several months with the primary mission of training, advising, and assisting the Afghan National Army Special Operations Command (ANASOC). 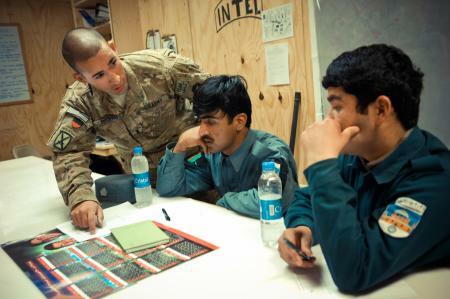 But, in addition, the unit members have found time to conduct a little humanitarian service work in Afghanistan. (The Baltimore Sun, January 25, 2018). Seminar on SFA. The primary mission of NATO's Resolute Support Mission in Afghanistan is Security Force Assistance (SFA). Norway is hosting a seminar on the topic in March 2018.